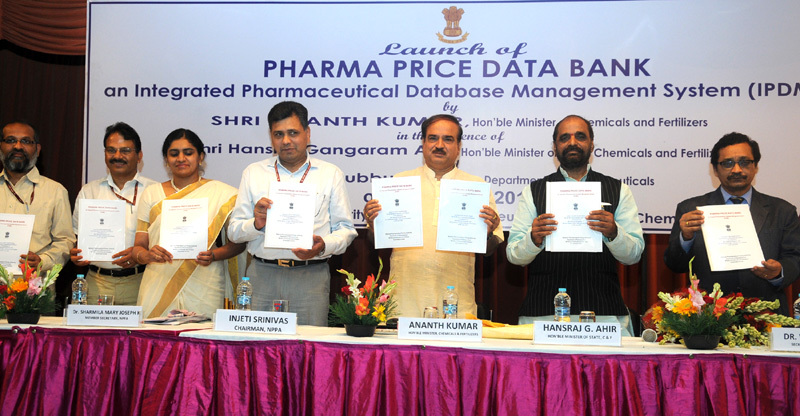 The Union Minister of Chemicals & Fertilizers, Shri Ananth Kumar launched Pharma Price Data Bank here today. It is an integrated Pharmaceutical Database Management System, managed and operated by National Pharmaceutical Pricing Authority (NPPA). 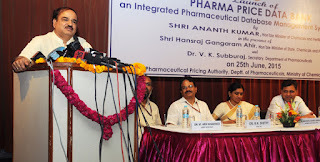 Speaking at the release ceremony, the Minister said that this is the first data bank of Pharma industry that will help the manufacturers, regulator as well as the common masses. He said that now Manufacturers can fill their mandatory forms online, the Government and NPPA can have comprehensive data, and consumers can benefit by having full information about the medicines. Shri Ananth Kumar said that 21st century is the era of information, and information is power. He called for ushering in next generation of reforms in the pharmaceutical industry so that the consumers are empowered to make right choice of medicines, based on complete information about the products, their composition and their rates. Shri Ananth Kumar expressed the hope that the availability of real time data will help in better policy interventions. Speaking on the occasion, Minister of State for Chemicals and Fertilizers Shri Hansraj Gangaram Ahir said that the Government is working for the welfare of the society. Appreciating the initiative of NPPA, he expressed the hope that the database will benefit the common man. The Secretary, Department of Pharmaceuticals, Dr. V.K. Subburaj said that the Databank will help in simplification of procedures. He expressed the hope that online system will become popular and companies will provide complete and timely information. 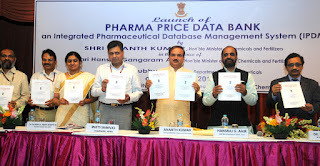 Pharma Price Data bank is an integrated Pharmaceutical Database Management System that will be used by pharma manufacturers/marketing/ importer/ distributor companies to make online submission of mandatory information/data as prescribed under the Drugs Price Control Order, 2013. Facility for submitting application for price fixation of new drug is also available. NPPA is already operating another portal “Pharma Jan Samadhan” that registers complaints about shortage or overcharging for medicines. The NPPA Chairman Shri I. Srinivas said that over 10,000 manufacturers making over one lakh formulations are there in the country, and this online compilation will help in better monitoring and oversight of the industry. The Union Minister of State for Tourism (Independent Charge), Culture (Independent Charge) and Civil Aviation, Dr. Mahesh Sharma held a meeting with Tourism Minister of Uttarakhand, Shri Dinesh Dhanai in New Delhi today. Today’s meeting was a follow up of the earlier meeting of Uttarakhand Chief Minister, Shri Harish Rawat with Dr. Mahesh Sharma to seek central assistance for development of tourism in the state. Highlighting the potential of tourism in Uttarakhand state, Shri Dinesh Dhanai said that state government wishes to develop tourism through an ambitious project of ropeways. He sought assistance for development of Kedarnath-Lincholi ropeway and ropeway between Tehri lake and New Tehri which provide a scenic view of the Himalayas. Dr. Mahesh Sharma assured assistance for the Kedarnath ropeway under the PRASAD scheme and assistance for Tehri ropeway under Large Revenue Generating scheme of Ministry of Tourism. Dr. Mahesh Sharma disclosed that the Tehri lake area will be developed as a mega destination under Swadesh Darshan scheme of the Ministry of Tourism. It will also include developing of walkway around the Tehrilake, the Union minister added. Dr. Mahesh Sharma also assured Shri Dhanai that the centre is making all efforts to provide funds for the ongoing tourism related infrastructure projects taken up by the state under PIDDC. Senior officials of the Ministry of Tourism and State Government were also present at the meeting. Officiating Director General NCC Maj Gen C Prakash flagged-in the NCC Girl Expedition team to Mount Deo-Tibba (19688 ft) in Himachal Pradesh at HQ DG NCC, here today. He congratulated the 31 girl cadets and 19 support staff for their successful ascent to the peak on 13 & 14 Jun 15. The Team Leader Col Gaurav Karki handed over the Expedition Flag to the DG during the ceremony. The all girls’ expedition was the first expedition to climb the mount in the current year. The weather conditions made the climb challenging and tough. The successful climb to Mount Deo-Tibba (which in Hindu mythology means the assembly place of the Gods) by the 50 member team, through difficult terrain, inclement and unpredictable weather conditions, was a splendid success. In his address, the officiating DG NCC congratulated the Cadets and NCC Staff and mentioned that this is a precursor to the next Expedition to Mount Trishul in Aug-Sep 2015. He said this exposure would hold the team in good stead for the ultimate mission of scaling Mount Everest scheduled in May next year. The Ministry of Health and Family Welfare organised an awareness and orientation workshop on the Kayakalp Awards, here today. Shri CK Mishra, Additional Secretary & Mission Director, National Health Mission addressed nodal officers from27 States and 3 UTs who participated in the workshop. At the workshop, the states were asked to work resolutely on improving cleanliness in the public health facilities which is the mandate of the Kayakalp awards. They were also informed that the Ministry of Health & Family Welfare would be supporting the states in their endeavors. In the current financial year, two hospitals in large states would get cash awards of Rs. 50.0 lakh for the best hospital and Rs. 20.0 lakh for the runner-up award. The Best District Hospital in small states would be awarded Rs 50.0 lakhs. The Ministry of Health & Family Welfare has instated the Kayakalp Awards under the Swachh Bharat Abhiyaan launched by Prime Minister on 2nd October 2014 that focuses on promoting cleanliness in public spaces. The Minister of Health & Family Welfare launched a national initiative for awards to Swacch Public Health Facilities ‘KAYAKALP’ on 15th May 2015 under the National Health Mission (NHM). KAYAKALP promotes a clean environment in public health facilities, which are essential to the dignity, comfort and speedy recovery of the patients. The Health Ministry has also issued Swachh Hospital Guidelines which lay down the protocol and processes for maintaining cleanliness and hygiene at public health facilities. Guidelines containing protocols for objective assessment of health facilities, allowing for comparison of two or more health facilities within a district or state for the purpose of ‘KAYAKALP’ awards have also been issued by the Ministry. ‘KAYAKALP’ guidelines will also help public health facilities to attain National Quality Standards pertaining to cleanliness. India and the United States of America (USA) signed Memorandums of Understanding (MoUs) on Cooperation on Cancer Research, Prevention, Control and Management and Collaboration in Environmental and Occupational Health and Injury Prevention and Control, and a Letter of Intent (LoI) on Antimicrobial Resistance Research, here today. The MoU on Cancer Research and LoI on Antimicrobial Resistance Research were signed by Shri B P Sharma, Secretary (Department of Health and Family Welfare and Department of Health Research), Ministry of Health and Family Welfare and Prof. K Vijay Raghavan, Secretary (Department of Biotechnology), Ministry of Science & Technology and Mr. Richard Verma, Ambassador of the USA to India. While, the MoU on Collaboration in Environmental and Occupational Health and Injury Prevention and Control was signed by Shri B P Sharma and Mr. Richard Verma. 13. Any other area as mutually decided between the Participants if and to the extent consistent with applicable statutes, regulations and policies. (v) Assessment and application of new and cost effective cancer diagnostic technologies for public health benefits, and the translation of technologies for global health. · Public health approaches for injury prevention and control including the areas of road safety, burn injuries and unintentional injury. The signatories welcomed signing of the agreements and hoped that these MoUs/LoI will usher in greater cooperation in the health sector which will benefit people of both the countries, in addition to further deepening and strengthening of cooperation and collaboration between the countries. The National Disaster Response Force (NDRF) observed the “2nd Commemoration Day of Rescuers Day” today to pay homage to the NDRF personnel who were martyred during Rescue Operations in Kedarnath two years ago. A wreath laying ceremony was performed and Guard of Honour given at the Martyr’s memorial built in Kedarnath by the NDRF at 11 AM. Senior officers from ITBP, Air Force and local Government were present at the site on this occasion. On this day two years ago, nine NDRF brave hearts along with 11 other rescuers of the ITBP and Indian Air Force made the supreme sacrifice when the helicopter carrying them crashed near Gaurikund due to thundering. The NDRF martyrs are Nityanand Gupta, Second-in-Command, Inspector Bheem Singh, SI/RO Satish Kumar and Constables Santosh Kumar, Ahir Rao Ganesh, K. Vinaygan, Sanjiv Kumar, Pawar Shashi Kant and Bassavaraj Yaragati. Following cloudburst and heavy rains, June 16, 2013 proved to be the dooms day for the pilgrims of Kedarnath and Badrinath. The holy pilgrimage became death bed for many devotees including the local inhabitants. To provide immediate relief to the victims, 14 Urban Search and Rescue (USAR) teams of NDRF immediately rushed to the affected areas from the different locations and carried out restless “Humanitarian Assistance and Disaster Relief” (HADR) operations in high ridges of the mountains in the utmost inhospitable condition. The specialized and skilled rescuers displayed their best efforts by creeping over the fragile and unreliable hills of the area and reaching to the victims who were lying helpless seeing the wrath of nature. As part of the Rescuers Day, a special expedition was flagged off from Ghaziabad to Kedarnath on June 18, 2015. The Chief Minister of Jharkhand, Shri Raghubar Das inaugurated the Conference and State Labour Ministers of Jharkhand, Bihar, Chhattisgarh, West Bengal and Odisha also participated in the Regional Conference. Shri Giriraj Singh, Minister of State, MSME made a two days maiden visit to Central Office, KVIC here today. In his interaction with Shri Arun Kumar Jha, CEO and Commissioner, senior KVIC officials and representatives of Khadi Institutions from the State of Maharashtra said that Solar Charkha which is a technology innovation is a revolution in Khadi sector. Shri Giriraj Singh said that the objective is to employ one lakh women in each parliamentary constituency and cover them under social security schemes. It also aims to increase Khadi sales from Rs.26,000 crore to Rs.1.00 lakh crore. “There is no increase in the number of people associated with khadi production due to low wages, exodus of artisans and less productivity” said the Minister. The Govt plans to make khadi a changing agent and believes solar charkhas will lower strain on weavers, increase productivity and generate between Rs.5,000/- to Rs.8,000/- a month for each workers. “To employ one person at textile mill with 25,000 spindles, the capital cost is around Rs.60 lakh, whereas it needs only Rs.60,000/- to Rs. 70,000/- in the case of a solar charkha” he added. During the meeting, the Minister also interacted with fashion designers who came out with practical suggestion to make khadi viable and popular among youth. He also had a brain storming meet with Dr. Harsh Kumar Bhanwala, Chairman and Managing Director of NABARD and Dr. Kshatrapati Shivaji, Chairman and Managing Director, SIDBI for convergence with KVIC for opening new employment possibility in the State of Maharashtra. By working in KVIC clusters and supporting women Khadi spinner and institutions through PMEGP schemes taking the advantage of CTMSE scheme with khadi activity. The Union Minister of State (Independent Charge) for Development of North Eastern Region (DoNER), MoS PMO, Personnel, Public Grievances, Pensions, Atomic Energy and Space, Dr. Jitendra Singh has received a cheque of Rs. 2,00,33,910/- from Deccan Herald, a leading English daily, as contribution towards Prime Minister’s National Relief Fund (PMNRF), here today. The Political Editor and Bureau Chief of Deccan Herald, Shri Shekhar Iyer, handed over the cheque to Dr. Jitendra Singh, and said that the amount had been contributed by the readers of Deccan Herald as well as its staffers and employees. Acknowledging the gesture, Dr. Jitendra Singh said, even though relief donations are dropping in from all parts of the country and abroad, as also from diverse sources ranging from political parties, social groups to renowned philanthropists like Mr. Bill Gates, contribution received from Deccan Herald assumes a different kind of significance because it has been collected by media persons who are actually the opinion makers in a democratic society. Appreciating the role of media at times of different calamities faced during the last one year of the Modi Government, Dr. Jitendra Singh said, whether it was floods in Jammu & Kashmir or the Hudhud cyclone in Andhra/Odisha coast or the earthquake in Nepal, Indian media’s reporting was always prompt and positive. At all such occasions, media went beyond its brief and also performed the role of social activism by informing about the whereabouts of missing people and at the same time prompting a mass movement among people to come forward and help the government in whichever form possible, he added. Shri Shekhar Iyer, Political Editor & Chief of Bureau of Deccan Herald said that their establishment is always in the forefront for offering assistance for social causes and therefore, its proprietors and the editorial heads were keen that the relief amount should be deposited directly in the Prime Minister’s office (PMO). The Government has directed all Government servants to strictly observe punctuality in attendance. All Ministries and Departments besides Autonomous Bodies, CBI, Lok Sabha and Rajya Sabha Secretariats and the Union Territories Administrations have been asked to issue necessary directions to all employees at all levels to mark their attendance in the Biometric Attendance System (BAS) portal on regular basis. In a recent Office Memorandum, it is reiterated that the BAS is only an enabling platform and there is no change in the instructions relating to Office Hours, late attendance etc. Citing provisions under the CCS (Conduct) Rules, 1964 the Memorandum reiterates that habitual late attendance will be viewed as conduct unbecoming of a Government servant and disciplinary action may be taken against such offenders.